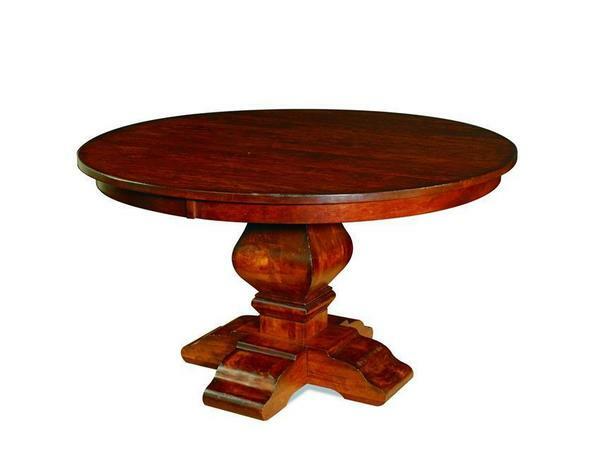 The Amish Wilmington Single Pedestal Table is available in a 48", 54" or 60" diameter. You can choose to have a smooth tabletop or a more rustic planked top with saw marks. Customize the look even further by selection your hardwood, finish, and extensions. Please call one of our Amish furniture specialists today with questions or ordering assistance. They are happy to help in any way that they can! This beautiful Single Pedestal Table is shown in Brown Maple Wood with a hand-planing, distressing and burnished with Michaels Cherry Stain. If you are looking for a larger table in our beautiful Wilmington design then check out of Amish Wilmington Double Trestle Table. If you are looking for chairs to match this Dining Table, please check Amish Wilmington Chair. Diameter: 48", 54" or 60"